When segmentation fails do you pivot to a new one? Here is a case study done by US Department of Energy for LED bulbs. The initial price is almost twice as much as traditional lighting systems. While consumer segments most likely are not willing to pay twice the price for LED, business segments are. That is if you show them the value. For instance, you and I may not mind changing light-bulbs every year because our opportunity cost is $0. But for businesses there are real costs associated with maintenance. Every bulb change avoided is not only savings in bulb cost but savings in maintenance costs. If you add these all up, despite the high initial cost, the LED systems deliver 9% in total cost savings over the lifetime. It seemed no brainer to start with the business segment that had real costs and savings (and budget to spend), show them value using hard numbers and gain adoption. So did Cree, the maker of LED bulbs, think. Cree based their strategy on a similar analysis that pointed to increased adoption by businesses because of energy and labor cost savings from switching to LED bulbs. 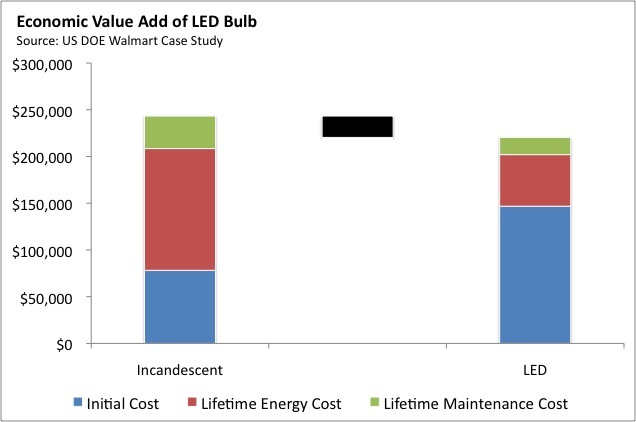 Value Waterfall – As someone who defined value waterfall, even I failed to take this into account while I did the economic value add math for LED bulbs. Despite the real value there are several aggravating factors like cost of doing business, trust discount, switching costs, etc. that knocked down perceived value. Pricing Model – The LED bulbs are priced twice as much as incandescent bulbs and deliver their value over long period of time. That is the LED pricing captures value upfront while delivering customers value over time. A better model for businesses would have been a subscription pricing model based on usage. Cree needed monetization model innovation to go along with their product innovation. The bet is that light bulbs might follow the same trajectory as touch-screen smartphones, whereby consumers grew comfortable with the technology at home and then insisted on having it available at work. While that worked for phones that we use everywhere and at work and think of it as part of our self the same logic does not extend to light bulbs what are simply part of the environment. Besides how can they get consumers to pay twice the price when the economic value add math does not add up and the fact that it does not have aspects of conspicuous consumption like a smartphone does? I wrote recently how monetization model innovations follow segmentation. Cree’s segmentation was not wrong it is their product positioning and monetization model that need to be realigned to the business segment. When your well thought out initial segmentation fails it does not mean you chose wrong and you must switch to a completely new one. Segmentation is a strategy and changing it is not like a product pivot. And there is no guarantee you will succeed with the new segment if you commit the same mistakes you committed with targeting, positioning and pricing with the first segment. How do you choose your segment and what do you do when your product fails to get traction?